Spring is FINALLY here! To help shake not-so-distant memories of winter, we’re taking the opportunity to share some of our favourite Spring décor trends. If you’re collecting ideas for a new space, revamping a tired style, or just looking for a quick room refresh, these spring colours and textures will leave you feeling sunny and inspired. Spring equals flowers. So it makes sense that we almost always see florals trending around this time. But in 2019 we’re particularly inspired by florals that are slightly washed out or dark and moody. These unexpected pieces look fresh for spring, but you can keep them around when the weather cools. 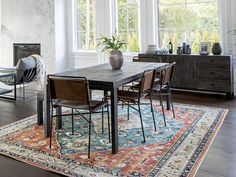 With a dark background and oversized floral pattern, the Blanchett Rug is the bold floor covering you need for spring. Style her in your neutral living room for a touch of romance, or as the finishing touch in a dramatic, feminine space. For a dose of spring on your sofa or bed, our newest accent pillows Windflower, Baroness and Duchess offer large-scale florals in washed shades. Bohemian prints can be intimidating, especially if you’re trying to blend this spring décor trend into a busy room. To make your life easier, our Faris Rug comes in your choice of vibrant multi-colour or monochrome grey and silver. On a smaller scale, patterned pillows like Zapata and Primavera bring trendy boho pattern that’s easy to mix and match. Natural textures are this season’s biggest stars (don’t tell the florals). And with so many textured accents in neutral and solid colours, this spring décor trend is easy to bring home. Soft accents like the Ellie Cotton Throw and Inala Toss are simple to slot in with existing décor. And for functional storage with spring style, add woven baskets like our Isidora family to hold toys, throws or potted plants. If natural texture feels too casual for your space, try adding velvet instead. In dark neutrals and a stitched pattern, our Weiss Velvet Toss is simple, sophisticated and totally touchable. After another long winter, warm brass accents are everywhere this spring. Watch for this trend in larger furniture pieces and decorative accessories. With a sculptural base in matte brass, our Maverick Side Table brightens up contemporary interiors. Brass is especially popular in lighting, and you can see the colour on bright pieces like our Gemma Pendant Lamp and Lantern Floor Lamp. Looking for smaller brass accents you won’t need to make room for? Our Kehlani Vases and Briella Decor Balls add a touch of shine to your sideboard or coffee table. Call it ballet, blush or millennial pink. This soft shade continues to be a popular choice for spring. From our Freja Vases to toss cushions in soft spring florals and solid pinks, blush accents can instantly revive any space. Worried about going overboard with pink? We think these feminine pieces pair especially well with casual furniture in neutral shades like our well-loved Berg Custom Sofa and Madera Nesting Coffee Table .